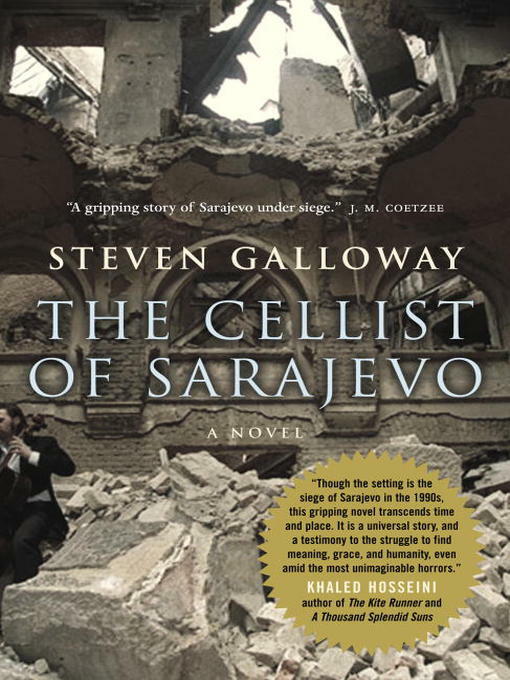 One day a shell lands in a bread line and kills twenty-two people as the cellist watches from a window in his flat. He vows to sit in the hollow where the mortar fell and play Albinoni's Adagio once a day for each of the twenty-two victims. The Adagio had been re-created from a fragment after the only extant score was firebombed in the Dresden Music Library, but the fact that it had been rebuilt by a different composer into something new and worthwhile gives the cellist hope. Meanwhile, Kenan steels himself for his weekly walk through the dangerous streets to collect water for his family on the other side of town, and Dragan, a man Kenan doesn't know, tries to make his way towards the source of the free meal he knows is waiting. Both men are almost paralyzed with fear, uncertain when the next shot will land on the bridges or streets they must cross, unwilling to talk to their old friends of what life was once like before divisions were unleashed on their city. Then there is "Arrow," the pseudonymous name of a gifted female sniper, who is asked to protect the cellist from a hidden shooter who is out to kill him as he plays his memorial to the victims.